COMPETITORS: CLICK HERE TO REGISTER FOR THE SHOW NOW! 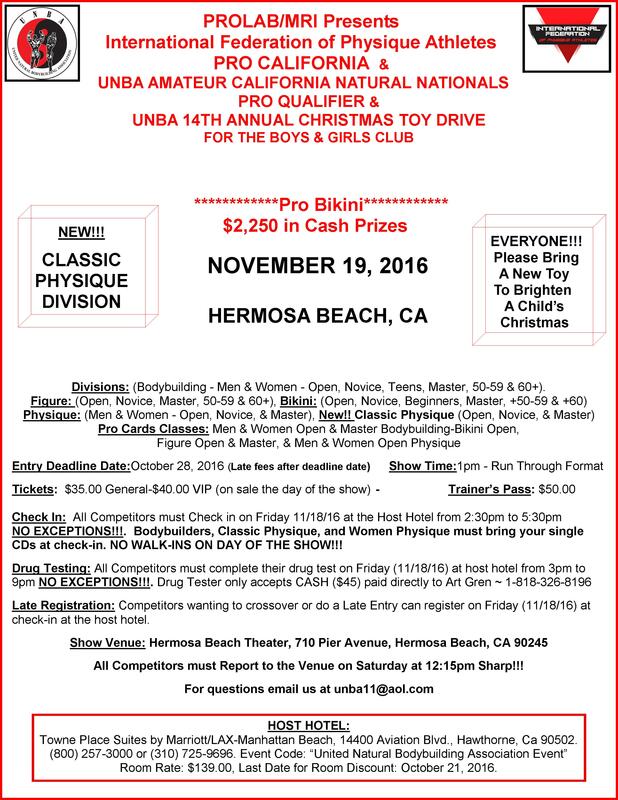 NOTE: By clicking submit, you agree to the following terms: I accept all of the rules and regulations set forth by the United Natural Bodybuilding Association. This is an Invitational contest. All competitors will be required to take a polygraph test, test paid by cash or money order. You may be required to take a urine test at cost to you. If you fail the polygraph or urine test you will be disqualified from the competition. I understand that none of the drug testing methods are perfect, and I agree that the urine and polygraph test are some of the best methods to check an athlete for being free of all so called bodybuilding enhancement drugs. I understand that if I’m caught using steroids or any other illegal drugs I may be reported. I realized that using these drugs is a Misdemeanor and or Felony and hereby give the UNBA the right to report the results of any of my tests to the Authorities. 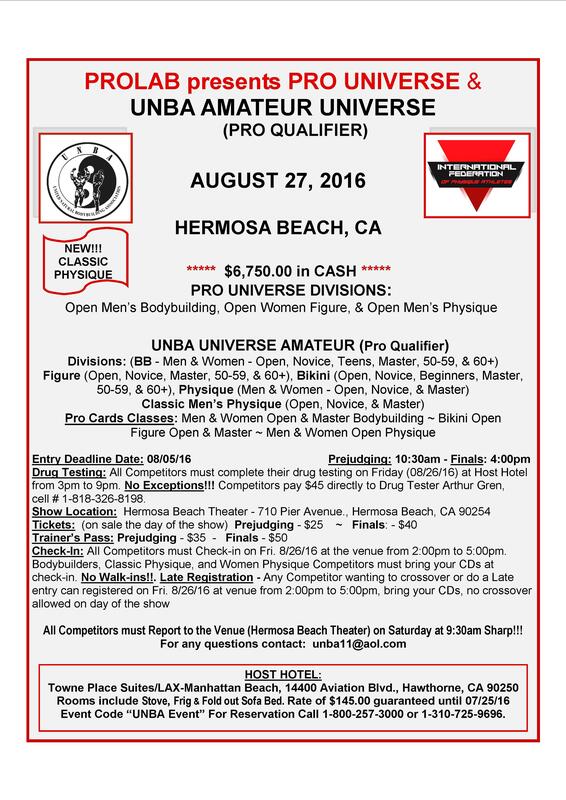 I will accept and abide by results of any & all tests used at any UNBA contest with good sportsmanship. I agree to waive and release any and all claims for damages or injuries of any kind suffered by me in any way due to any testing, traveling to and from, and by participating in this contest, against the UNBA, Eric & Doris Waits, Workers, The Site, Promoters, Officials, and any other Organizations involved. I grant permission to the UNBA to use any photos, videos, etc., concerning me for any legitimate purpose. I will accept and abide by all Official decisions. I hereby certify that I have read this document; and, I understand its content.